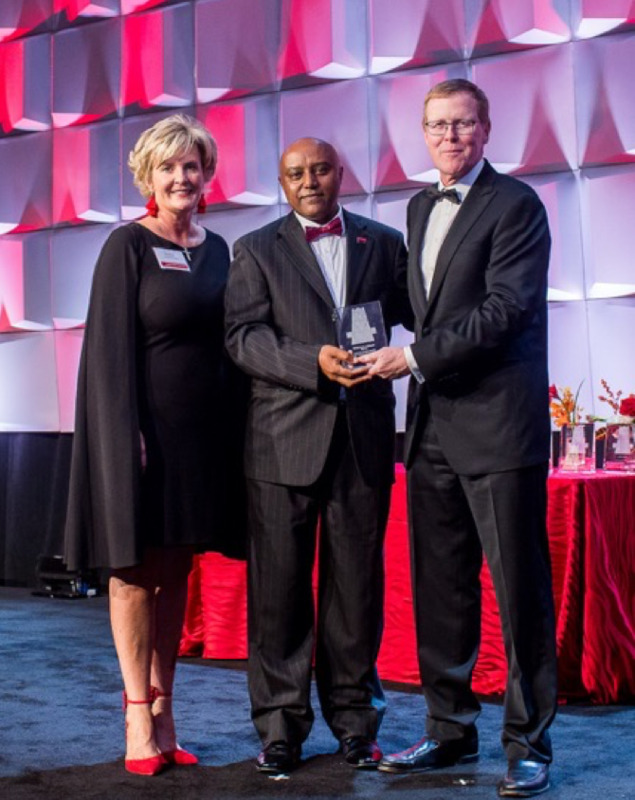 Dr. Gebreyes, professor in The Ohio State University Department of Veterinary Preventive Medicine, is the executive director of Ohio State’s Global One Health initiative (GOHi) and director of Global Health Programs for the College of Veterinary Medicine (CVM). GOHi is Ohio State’s largest, interdisciplinary example of institutional teamwork operating on a global scale. Under Dr. Gebreye’s leadership, the program has created partnerships between health organizations from around the world and hundreds of Ohio State students, faculty and staff from the university’s seven health sciences colleges, as well as the colleges of Arts and Sciences; Food, Agricultural and Environmental Sciences; Business; Engineering and Social Work. GOHi projects are taking place in Latin America (including Brazil and Mexico), East Africa and Southeast Asia. This past summer, a large number of multi-disciplinary teams from Ohio State, including CVM resident Dr. Maria Belu, professional student Sarah Waibel and faculty members Drs. Jeanette Quin, Armando Hoet and Gebreyes, worked in Ethiopa to help eradicate rabies (read story) and develop curriculum twinning, among other activities. Dr. Gebreyes joined university leaders led by Provost Bruce McPheron, Ohio State contributors to the GOHi network and numerous dignitaries from Eastern Africa on November 11, 2017 for the official christening of a regional office in Addis Ababa and its registration as an NGO by the Ethiopian Charities and Societies Agency. In 2009, Dr. Gebreyes helped found the International Congress on Pathogens at the Human Animal Interface (ICOPHAI), as a way to unite professionals who are dedicated to the health of humans, animals and the environment. Scientists and policymakers from more than 30 countries recently attended the Congress in Doha, Qatar, focusing on how environmental change impacts global health. Dr. Gebreyes is also the director of the Infectious Diseases Molecular Epidemiology Laboratory. His research focuses on antimicrobial resistance and tracking foodborne pathogens in Ethiopia, Kenya and Tanzania.